Why Madame Tussauds Museum is special ? If you are a skeptic, you’d probably think a wax museum is a wax museum is a wax museum, right? What’s the hype all about? Well, for starter, Madame Tussauds has stepped down from the pedestal and embraced her visitors with a revolutionary concept – the wax museum with exhibits you can touch, hug, play with and even kiss. Imagine shooting hoops with the Houston Rockets centre Yao Ming, appearing on The Oprah Show, practicing Kung Fu with Bruce Lee, drinking espresso with George Clooney, or… ahem… putting your arm over your old pal Mao Zedong’s shoulders. What to explore at Madame Tussauds Museum? With 10 exhibit rooms decked out in real-life themes, the museum feels more like a journey from one time-warp to the next – Lady Di next to Mao Zedong, Pablo Picasso and his Cubist painting next to Thailand’s leading and somewhat eccentric forensic pathologist Dr. Porntip Rojanasunan in her full rock star regalia, Barak and Michelle Obama in their Oval Office next to Aung San Suu Kyi and the Dalai Lama. Out of the 10 rooms, The Royal Room is the most elegant and culturally significant, as it showcases the wax figures of HRH Prince Mahitala Thibed Adulyadej and HRH Princess Srinagarindra, the late parents of His Majesty the King. All the decorative elements in this room are meticulously planned down to the tiniest details, whether the royal costumes, colour scheme, floral graphic patterns and music, all of which received the Royal endorsement from the Thai Royal family. This is the only room in which you are not allowed to touch the figures. Enough with all formalities, let’s get to the fun part. While Picasso is taking a cigarette break, steal his canvas and create your own masterpiece. Need a piano lesson? Learn it from the Maestro, Ludwig van Beethoven. Meet Albert Einstein in person, or hug him if you are a fan – his moustache looks so real that it invites your touch. Did he really have his hair like that all his adult life? Following Einstein’s glance, you see what looks like Thailand’s Democracy Monument and a foreign sculptor working on his soon-to-be masterpiece. This is the man behind so many important monuments you see in Bangkok. So, meet Silpha Bhirasri (born Corrado Feroci), an Italian sculptor who helped shape Thailand’s modern art scene. Sports fans, be prepared for some action with your heroes and heroines, whether it’s a game of tennis with former world’s number one Serena Williams – whose biceps are, by the way, bigger than my thighs – kicking bendy goals while David Beckham is watching, putting with Tiger Woods, or lifting weights with Thailand’s Olympic gold medalist Pawina Thongsuk. 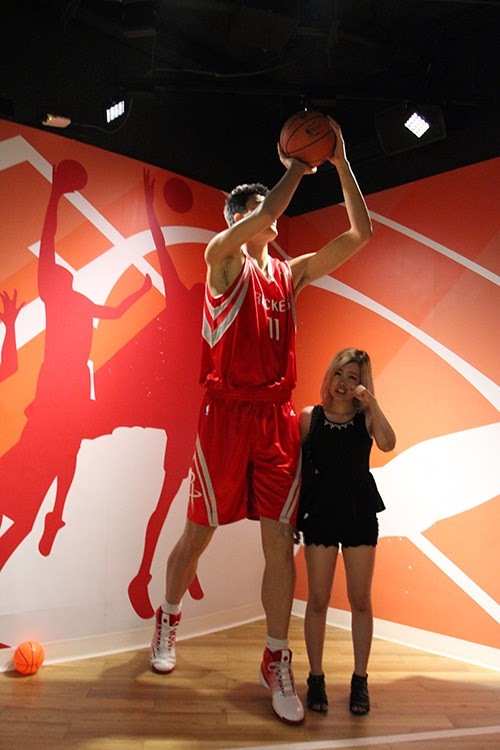 Yao Ming, by the way, is as tall as the basketball hoop –try and steal the ball away from him! After saying goodbye to Yao, it’s time to hit the limelight with your favourite pop idol. Take charge of the microphone, while Madonna and Britney can only look on, or challenge the King of Pop with your best moonwalk. After you’ve had enough fun, proceed down the red carpet and join the glamourous party with the most beautiful faces of Hollywood, whether Johnny Depp, Tom Cruise, Nicole Kidman, Leonardo DiCaprio, Julia Roberts, Brad Pitt, Angelina Jolie, and so on. Behind the glory and glamour, what makes Madame Tussauds Bangkok different from other wax museums in Thailand is the quality of craftsmanship and attention to detail, from set designs all the way to daily maintenance. It takes British craftsmen between three and six months to finish one wax figure, and the process is highly elaborate. Implanting hair is perhaps the most labourious task, as is the case of some female stars. Each strand of hair is implanted one by one, using real human hair. And the effect, when combined with the sparkle in the figure’s eyes – try looking into Julia Roberts’ or Princess Diana’s – is totally stunning. You can learn all about the craft of wax work from the second-floor exhibit on the history of Madame Tussauds. The museums’ souvenir boutique carries an interesting collection of memorabilia and quirky accessories you might want to bring home with you. Madame Tussauds is a five minutes walk from BTS Siam station. BTS Siam station is right in the middle of the city and easy journey from anywhere in Bangkok. Siam Discovery, 6th Floor, 989 Rama 1 Road, Pathumwan. Stopable in front of Siam Tower building. Purchasing tickets online is much cheaper the normal price. They also have a tie up with the Siam underwater world by which you can get discounted prices for both the places. Thoroughly enjoyed the visit to Madam Tussauds Waxworks Museum in Bangkok. Could get up close and personal with so many well known celebrities - the best part was that you could inter-act with the "wax work" celebrities. So life like, you expected them to talk to you. The taking of photographs is encouraged and there are many props available for you to use, when taking a special photo with your celebrity hero. Loved the "White House" and sitting in the Oval Office at a desk, with Michelle and Barack Obama standing next to you. Also could sit with Oprah and Queen Elizabeth, see Julia Roberts, Katy Perry, Einstein, MIchael Jackson, George Clooney, Liberace, Brangelina, Princess Diana, to name but a few. Lots of sports stars as well. All in all a very enjoyable exhibition - recommended.